Empty! Behind the door is a work of art…..
One way to clean a brush after use I suppose. I am as guilty as the next person for doing similar but I usually do it on walls that are going to be painted later. I don’t think that door has seen a lick of paint on the inside for many years, certainly long before we moved into the house anyway. There was a free-standing unit at the rear of the room which I moved out and put into the adjacent much larger room we call the workshop which itself needs a thorough clean out. Most of what we took out of the storage room has been put in the workshop but much has also been scrapped too. Now the serious work can begin, replacing bricks, filling in holes in the brick walls and floor tiles, work on the ceiling and shelving, sealing the brickwork and of course painting it all. It will take some time to do but as I usually say these days there is no hurry. It was now Wednesday morning and I hadn’t anything special to look forward to in the way of work or anything else either but there was one thing I had to do nevertheless. I had to tidy up the gym/boiler room and collect and put tools, paint and paint brushes away as well as cleaning them beforehand. Thirty minutes should have been enough time but I ended up taking two and a half hours! Minor touching up of paintwork and giving the rear door which leads out into the garden a thorough cleaning both inside and out all added to the total time I had spent down in the room. Note the washing had been cleared from the line by E the night before so the room appears as it does for the majority of the time. Even if all three washing lines are full of washing none of it would interfere with the use of any of the equipment in the room but look at the open space now that we have cleared out the clutter that once occupied it. The project is for all intents and purposes now complete but as I mentioned in yesterday’s post I have yet to treat the floor. Already I have the next project in my thoughts but I will tell you about that when I tackle it. ………..Well maybe but at this point in time all I can do is wait and see. I think I made the right decision in calling our house ‘Hassle Castle’. There are always little problems here! Anyway today, that is Wednesday 21st, which also happens to be around the Spring Equinox, I have spent most of the daytime in the cellar room we now call the gym. It is also the boiler room and the room in which we hang washing if it is raining outdoors. Having done all the work in there over the last few weeks it looks more like a gym than it ever did. Today I spent some time on the equipment before breakfast and after breakfast I gave the room a good tidy-up removing all those things not now needed in there. I then finished the painting of the boiler cupboard and the window frame. Before doing anything else I did some remedial work on the furniture of the door leading into the room and also on the room cupboard. All that work took me till lunch at one o’clock. After lunch I began applying a priming coat of paint to the interior of that cupboard. A few days earlier I had spread some concrete screed over the floor inside the cupboard and it looked as if it hadn’t dried out completely in the rear corner on the right-hand-side. In the picture above the same area looks a little darker than the rest. Whilst applying the priming paint on the walls around that spot I noticed the paint wouldn’t stick and it could only be due to moisture. I would leave the base area alone for a few days to see what develops. It would either dry out or remain damp. Our house does not have a damp proof seal between the lower bricks, it was designed that way when it was built. On the rear of the cupboard wall on the outside of the building is a downspout and surface water drain which I had sealed around at ground level with cement a couple of months ago but it could be that I need to investigate the possibility that water is somehow still getting into the wall by some other means. Had we not bothered decorating the room and the cupboard (which did need a good refurbish) we would not have noticed there might be a problem. A case of out of sight out of mind! It isn’t a major problem but it requires looking into. For someone who is supposed to be semi-retired I have been very busy with my electrical work during the week gone by. It is now Monday and I am wondering what the new week has in store for me regarding electrical work. Most of the jobs I do these days are small though occasionally I will get several ‘small’ jobs to do at the same address! This happened twice last week. I get tired if I do too much especially when the weather is warm as it has been for some time now. The heat drains my energy and that is why I prefer cooler weather if I am working. Our little decorating project in the top room came to a grinding halt more than a week ago because the weather has been too nice to remain indoors. There is little to do up there anyway, a couple of hours painting over a couple of days and some other small jobs to do will see it finished as far as our involvement goes. Once the carpet has been fitted there will be nothing left to do. The weather can’t remain fine and sunny forever can it? On the days I haven’t been working away from home E and I have been busy in the gardens, mostly removing plants or planting new ones (see previous posts). On Thursday afternoon whilst E was out shopping I removed two plants from one of the two smaller flowerbeds I had constructed on the patio last Autumn. We had purchased what we thought would be small and slow-growing plants when we first populated the beds. Some of the plants are Cyclamens which don’t grow fast or large as well as another variety which likewise remains small but one other variety does. I don’t know its name. The plant in the picture below is of course a Cyclamen. We weren’t aware of this when we purchased them but this season two of them grew so large they were blocking out the other plants. This only happened in one of the flowerbeds for in the other bed these particular plants did not survive and did not grow at all. I removed the two plants to a position beneath the apple trees near to the greenhouses further along in the same bed as the new Dahlias and Scented Lily we had planted a week or so ago. They survived the move as they had fully developed root balls which were not disturbed during the process. The thing about gardening is that there is always something to do all year round but especially in the growing seasons. In the unlikely event I don’t get any electrical work whatsoever you can be sure I will find work in the gardens and if it is raining I will be working indoors, if I am up to it! We were expecting the guy who was to build the bedroom furniture on Thursday morning and as you read in yesterday’s post he arrived on time and spent ten hours here. He returned on Friday morning and again put in a full day’s work, though this time just nine hours and that was it, the work was completed! Just nineteen hours over the two days. Here is the result of his hard work…. Robbie had to get in on the action too as you can see in the last picture, Robbie being the robot vacuum cleaner. We had actually swept the floor and then vacuumed it with the ordinary mains-connected cleaner beforehand. Robbie was upstairs cleaning the carpet on the first floor landing but wandered in through the open door. There was little for him to pick up anyway on the wooden floorboards. We’ll let him have a session in there when the carpet is laid but that will be a few weeks away yet. E and I cleared away all the off-cuts of timber and panels left over from the work and there was plenty of that. There was even a pack of six or eight two-metre lengths of 50 x 25 mm timbers but I let the joiner have them by way of a thank-you for all his work as he wouldn’t have taken a tip. From what he had told me I think he will have been well-paid for his services by the furniture company employing him under contract anyway. We have enough timber in storage in the cellar already. Our next task in the room will be to fit a picture rail and paint the walls not covered by the furniture. My little job for Saturday was to fit the power outlets and the lighting switch in the boxes the joiner had so kindly fitted into the walls of the bedside cabinets which you can see in the first two pictures. I will have most probably exchanged the two power outlets above the low-level units with ones that have built-in USB chargers too. I never expected to see the guys who are rebuilding the garden wall to turn up on a Saturday morning especially as one of them had been unwell on Friday. That meant I was in no hurry to get up early though I did get up around 8.30. It took some time before I got downstairs though. Well you know how it is with some of us ladies, we like to take the time making ourselves as pretty as possible. So I didn’t get downstairs for breakfast until almost 10 o’clock when I ate breakfast. I had the day to myself so I thought I would make a start on the electrical alterations we had planned for the bedroom refurbishment. This meant removing the existing three 13 amp power outlets and altering the wiring to accommodate five outlets in their place but in new locations. All the outlets will be twin outlets as I never install single units except where there only needs to be single ones. Two of them will be located in the bedside cabinets, one either side, one will be in the space left between the existing radiator and the new wardrobes and the other two will be located above the low-level vanity units to accommodate a television, perhaps a radio and whatever else that may need a power point, hairdryer and such things. I wanted to provide a television aerial point but thought there were no spare outlets on the main antenna amplifier I had fixed in the loft space. Indeed there were none but to my surprise I discovered the coiled-up length of aerial cable I had left beneath the floorboards near to the bedroom door when I had installed all the others many years ago! I’d had the foresight to put it there for use when the room was in use. As I mentioned in an earlier post the bedroom hasn’t been used in years. During the afternoon I was able to install the wiring for the bedside unit outlets leaving them coiled-up beneath where the cabinets will be. I will have to liaise with the joiner so that the wiring will end up inside the cabinets. I will arrange for him to cut out the necessary holes to accommodate the outlet boxes. I was able to run the cable for the outlet near the radiator and fit the outlet in the wall too. I was also able to install the aerial cable and the cable for one of the outlets above where the vanity units will be sited but the other outlet couldn’t be installed until the old power unit beneath it is removed and the existing wiring re-arranged. I didn’t have enough time to do that part as it was getting late and I was tired. There also remains the alterations to a switch position now supplying one of the floodlights on the front of the house. I will make the decision where to move it once I have more information from the surveyor who is coming on Thursday to make accurate measurements of the proposed new furniture. It may be that I can leave the switch inside the new units but raise it from its present position for easier access. Finally I have to run a cable from the existing ceiling light switch which is by the bedroom door to a position on the bedside cabinet nearest so that the light may be switched from both the bedside and the door, a two-way switching arrangement in other words. Before I could do any of that work I had to remove the carpet underlay and roll it up to be re-used when the new carpet is laid. I needed access to the floorboards. So a few hours work got much done. I had to spend a little time over the weekend sorting through old bags and boxes which are stored in the first floor spare bedroom which I am planning to refurbish soon. I had to make sure there was no sensitive or personal items or things that belonged to my sons for most of what was in the room belonged to them. I had asked them repeatedly to check for anything they might want to keep but all I got as an answer was that they were not bothered. However and nevertheless I sifted through it all and did find some things which I have put elsewhere for them to have a look. I was amazed at what was being thrown away, numerous pairs of shoes and trainers, jumpers, hats and other items of clothing, even unused toiletries. In fact there was a large amount of clothing all neatly ironed and stacked on the floor! There were several gadgets and ‘toys’, a television, video tape players, old mobile phones and chargers, a desk-top computer, large amounts of CD‘s and odd items of all kinds. There were several books including a copy of The Karma Sutra fully illustrated with photographs (don’t ask). There were two sets of unused, still in their wrapping aluminium car mats of the type usually found in rally cars, a heated steering wheel cover, numerous photographs and reams of paper all to do with their university days. There was also a large box filled with various brand-new unopened games and a full set of snooker and billiard balls! The list goes on. There were at least six large ‘grips’ of the type used to carry gym equipment and clothing. I have not thrown all of them away but a couple were damaged and worn and those I did throw out, that is they were left in the room for the guy who removed it all. It wasn’t all about the boys though for in the room was a twin bed, a convertible settee/bed and a couple of old heated blankets and three chairs. No wonder the door was kept shut but as we didn’t need the room it became a dumping ground. That is the problem with a large house when some of its rooms are not in daily use. When we first moved in almost all of the rooms were in use because there were seven of us in the house; now there are only two. I suppose you could compare it to the story of the Ten Little Indians who all disappeared one by one. When the last two Indians depart all that will be left will be memories and empty rooms until someone else continues the saga. Wednesday proved to be a really nice and sunny day for a change. The weather hasn’t been that good for weeks so it was pleasant to have lasting sunshine. I went to do a job in the morning, as it turned out it wasn’t a big job but I was told they would need my services again within a few days once they have purchased the replacement lighting units they will want me to install. It turns out that the guy of the house is a friend of the manager of my local pub who had recommended me. I was also told that having worked in his sister’s house and her friend’s house too they both had recommended me. I suppose even the infamous can get recommendations! Ha-ha. I guess I must be doing something right. When it came to payment the guy insisted I take more than I had asked, which was a bit of an unexpected bonus. Whilst I had been working at the house I realised that one of my screwdrivers was missing and I then remembered where I had left it. On Monday afternoon I had installed a replacement outdoor light adjacent to the front porch and had placed the screwdriver on the low roof momentarily. I had forgotten all about it. I drove to the house which was only a couple of miles away and caught the guy just about to leave to do some shopping. He had seen the screwdriver and had taken it indoors. I should have phoned ahead so I was fortunate to have caught him at home. I thanked him but didn’t ask him why he hadn’t phoned me to let me know he had found it. Had I forgotten where I had left it I suppose he might never have told me. This has happened to me a couple of times in the past and I have lost one or two tools as a result. It proves not all people are as honest as they would have you believe. Anyway the year has started off well and I am pacing myself as I said I would. Normally I would have returned home after a morning at work and then begin to work at home, a project or some gardening, both of which I have in my mind to do if I am able but they can wait a tad longer. As I am getting back into the swing as it were I will make a start on the things I have in mind to do, a bedroom refurbishment and of course the gardening! Just before I wrote this I called a guy to have the bedroom emptied of all the stuff that has accumulated in it whilst it has not been in use over the last few years as I would have to hire a skip (dumpster) if I was to do it myself but some of the items are far too large for me to move them myself. At least the room will then be ready for working in and hopefully I shall be too. We had been let down by the guy who promised to tile our bathroom. He told us that he’d had a bereavement in the family and asked if we could postpone the date he was due to start however after two weeks he still could not be reached so we employed someone else. The second guy turned out to be somebody I had met some years ago and we had gotten on well then. He was enthusiastic to do the tiling for us and he gave us a reasonable quote and a start date. He phoned three days earlier than the earliest date he suggested he might be able to begin the work and indicated that the job would probably take four and a half days. He started the job last Wednesday and has been working hard, hopefully finishing today. We have been looking after him, supplying him with his lunch each day and plenty of tea and coffee. We are pleased with his work and he with our hospitality. As the work has been progressing he has been informing us of his intentions, what he is intending to do next and so on, promising all sorts of things but never actually doing those things as he says he will. He has been carrying on with this approach throughout his time here but we now realise not to take him at his word. The work hasn’t suffered though and in fact has progressed very well. His workmanship is excellent too. We just wonder why he feels the need to promise one thing and do something else instead. One thing we find very irritating is the way he often leaves both front doors open, the outer one and the one inside which together form the porch. It isn’t that they are being left per se, it is because of the cold winds that have been blowing these past few days. Because he also insists on having the windows in the bathroom open most of the time that wind blows through the house and up the stairs making the house unnecessarily cold. E has been switching off the heating for she doesn’t wish to heat up the whole of Southport! Eventually he got the message and now keeps at least one of the doors closed whenever he goes outside to collect materials from the garage, wash his equipment under the garden water tap or to simply have a cigarette. The heating has remained off during the day though, it is pointless trying to keep the house warm with the constant traffic flow. It has become somewhat of a relief when he goes home each evening and we can get warm again! I suppose there is one consolation though, had it been Summer the house would now be full of flying insects! For all his funny ways he is a nice guy and a conscientious worker, one we would gladly recommend to anyone. Teflon tape is wound around the pipe threading three times underneath this bathroom sink. It helps seal the areas between the pipe threads when a high pressure hose connection is screwed to this pipe. Today, Thursday, we are half expecting the guy who is to do the tiling to come tomorrow to make a start but I fancy it might be Monday before he appears. He just said that he might get the chance to start on Friday, not that he definitely would. It is hard waiting for others I have to admit for we are impatient to get back into the room to continue with the work. By this time next week we are expecting most of the tiling work to be complete and by Saturday we will be able to resume work ourselves. Things left to do are fitting the basin unit and hand basin and connecting the plumbing, fitting the shower tray and glass screens, fitting and connecting the shower unit, fitting and connecting the toilet and outside, the waste pipe, fitting the bath, fitting the bath tap (faucet) column and the associated plumbing, fitting the heated towel rail/radiator and its associated plumbing and fitting the mirror. Theoretically a few days work or maybe a couple of weeks depending on my availability to do it. Since we did the wet room a few months ago we have had one or two problems with the floor seal around the waste grid. At one point we had to remove four tiles and re-bed the grid and leave it for a few days to ensure the cement was thoroughly dry before relaying the tiles and leaving them a few days for the cement to dry too! At first all went well bit a slight crack in the cement around the grid appeared though it wasn’t leaking out water through the floor so we had to fill that crack in and again leave it for a day or two. Teething troubles we could have done without but at least everything worked out in the end. It meant we had to use the en-suite bathroom to one of the bedrooms to shower/bathe whilst the cement dried out. 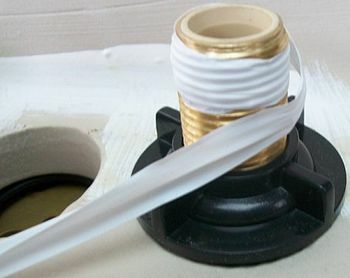 Whilst we don’t expect the same problems with the bathroom there may be one or two niggling problems with water leaking from waste pipe connections but all those connections are above floor level. Plenty of PTFE* tape will be used I’m sure. The waste pipes themselves have been welded together as they are all below floor level. As the weather improves we will be spending more time in the garden so we need to get the bathroom project out-of-the-way. We still propose to make another toilet and washroom down in the cellar with access only from the garden but as that work will be accessed solely from the garden it will be easier to flit between the two! Update: Since I wrote this a couple of days ago things have moved on. The tiler called us on Tuesday evening to say he would be commencing work in the bathroom the following day, that is yesterday and has made good progress. He tells us that he is off to London next week to work on a contract down there so I am thinking he will push on and complete our job before the weekend.